Update: I’ve revised the info here to reflect gear options and prices from mid 2017. One of the most common questions beginning sound effects recordists ask is which equipment to buy for field recording. What is the best digital audio recorder? 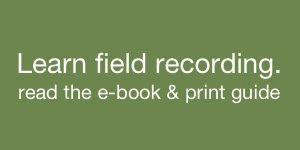 In this article I’ll review the options for buying digital field recorders. To begin field recording you’ll need a recorder, headphones, a microphone and cabling. Optionally you may add a separate preamp. And let's not forget your most important equipment: your ears. Today we'll discuss how to choose a recorder, and what features to look for. The digital audio recorder market exploded around 2006. Recorders were once made only by large companies such as Fostex, Nagra, Tascam, or HHB. Now we're now seeing smaller companies produce inexpensive versions of recorders. Many of them are marketed to musicians. 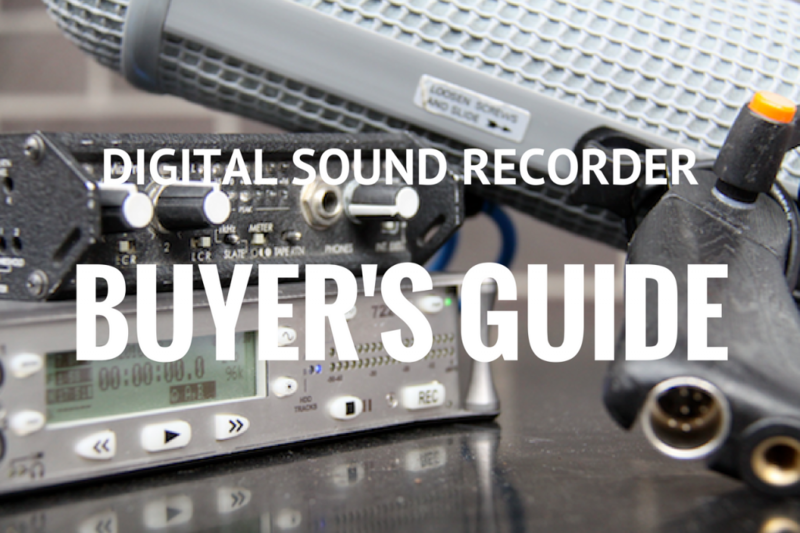 In this article we'll look at choosing digital recorders for field recording sound effects. There are dozens of recorders available. Some may be obsolete six months from now. So, instead of providing a detailed list of the best recorders today, I’ll post a checklist of features to look for when buying a digital audio recorder. Budget. Digital audio recorders appear to be classified in four categories: below $500, $500-$1,000, $1,000-$10,000, and $10,000 plus. Are you planning on field recording? Will you record mostly foley in a studio? Are you working with a variety of microphones (condenser, dynamic, etc.)? Bear these things in mind when considering the checklist below. Preamp. Pretty much more important than anything else if you are using condenser microphones. If the preamp isn't clean or quiet, even the Cadillac of microphones will be affected. Test the quality of the preamp with condenser microphones at low, medium, and high levels and listen to the noise floor. Is the noise floor high even at low levels? How thick or present is the noise? Recording format. Which file format can the recorder capture? Typical options are WAV and MP3. 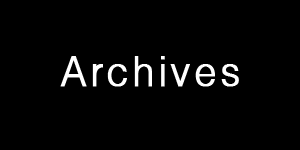 Some offer space-saving FLAC files, or high-resolution DSD formats. Additional considerations are bit depth and sampling rate. Is CD-quality (44.1 kHz 16-bit) sufficient, or do you require high-resolution 96 kHz, 24-bit audio, or even 192 kHz? Although CD-quality sounds fine, 24-bit recordings produce a notable difference. Usually 96 kHz and above is important if you expect to be processing the file (time twisting, pitching the file multiple octaves, etc.). 96 kHz remains the standard for sound fx libraries, however. Portability. Are you planning to take your recorder into the field? Will you be recording solely in a studio? Construction. Is the recorder built with cheap plastic? Will the buttons wear out in six months? How durable is the recorder? Multi-track. Some recorders can capture 4 tracks. More expensive recorders, such as the Deva series or the Sound Devices 688 ($5,998) can capture 12 or more tracks. If the recorder has multi-track capabilities, check at which sample rate multi-track recording is available. For instance, a recorder may be capable of recording 10 tracks, but only 48 kHz/24-bit. Higher sample rates are restricted to a smaller amount of tracks. Sound Devices' 633 ($3,229) is an example. External inputs/outputs. High-end recorders will offer multiple inputs. XLR inputs are often preferred. Ensure that the XLR jacks are lockable so that the connectors cannot be pulled out from the recorder. Less expensive recorders offer mini connectors, which may not be grounded and could pick up electromagnetic interference, such as radio waves or hum. Design. Size, weight, and construction are important considerations if you plan to be mobile. “Run-and-gun” field recordists will need a light and durable option. This is less of an issue if the recorder is staying safe in the studio, where a less sturdy countertop recorder will do. Interface/controls. Is it easy to change the recording levels? Is it easy to record, review, and play the sound? Touchscreen recorders, like the Deva series, are interesting, but if you're guerrilla recording, tactile cues are essential. Each function should have a separate button with a distinct shape. The record button in particular should be different than any other. Media. Recorders use memory cards, hard drives, exterior DVD-RAM drives, or a combination. Removable media is nice to have if you expect to be away from a workstation and may need to swap out your media for additional storage. Manufacturer. A fly-by-night company may abandon the recorder in a few years when a new model is released. More established manufacturers will have established lines of support. Firmware updates. Are you able to update the firmware after purchase? Some manufacturers update the firmware software over time, which can fix bugs and offer additional features. Warranty. A good company will allow you to register the recorder via mail or the Internet allowing for a window of tech support or repair. This also indicates a company's faith in the quality of their recorder. Connectivity. Can the recorder connect directly to a computer? Does it use USB, FireWire, or a proprietary connection? How fast will data transfer over this connection? Does it lack a connection and require memory cards to be used directly with a workstation? Timecode. Some recorders also imprint every sound recording with timecode. Typically this is designed for production location recordists (i.e., on set) so that the recordings will be in sync with the camera. Note that some recorders support timecode, but are not able to generate it themselves. Instead, they must have timecode supplied from a camera or another recorder. Time code can be very useful when multiple recorders are far from each other, and marking a recording with a vocal slate is impossible. For example, imagine recording a car with three recorders: one inside the car, one on the side of the road and a third in the distance. When it is time to master the sounds, matching timecode on all the recorders will help you line up the recordings in a session easily. Menu design. Can you delete or mark recordings quickly? Find settings easily? Change options quickly when in a challenging situation? Start up. Lower-end recorders take longer to start up. This is not absolutely essential, but when you miss your first rare effect because your recorder takes 20 seconds to boot, you'll wish you had a faster start up time. Pre-roll. Often an unplanned take or recording can spring up on you. Pre-roll is handy in these situations. The feature begins capturing a buffer of audio while it is armed, then commit it to the file when recording begins. It essentially allows a field recordist to capture 5-10 seconds of audio “in the past,” prior to pressing the recording. This option is usually limited by sample rate – the higher sample rate you record at, the less pre-roll time is available. Digital interface. Some recorders double as a digital interface or breakout box. 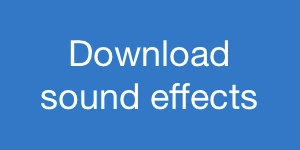 This allows you to capture audio through the recorder directly into a supported sound editing application on your computer. Neverclip. A feature included in Zaxcom recorders that prevents clipping. MARF. Another Zaxcom feature. The Mobile Audio Recording Format protects sound files during improper shut downs. Storage redundancy. Records to multiple formats simultaneously. Good for backup. A godsend when a hard drive fails or or a SD card becomes corrupted. Power redundancy. Multiple powering options: AAs, battery packs, AC, or advanced options such as NP powering systems. Power termination protection. Keeps a field recorder alive for a few precious extra seconds to allow the unit to shut down gracefully and save recordings from becoming damaged. Power switching. Allows swapping between power sources instantaneously if one power source fails. Remote control. Operate the recorder and name tracks from a distance using smartphones or tablets. Ambisonic support. Does the recorder allow smooth operation when recording four channels of Ambisonic sound effects? Usability. Considering what the recorder was created for, how well does it function in this role? Usability also considers features like: intuitiveness, training required, balancing the role of the user and the recorder. Does a portable recorder work well as a device meant to be carried around, or does its design relegate it to desktop use? Good usability will depend on how well the recorder functions in this role, as well as how easily a recorder lets the recordist actually record instead of operating the device. The Zoom H6 ($319) is the flagship of Zoom's handheld portable models. It captures six tracks of audio (4 x XLR, 2 x onboard microphones). Taking a page from professional camera lenses, the H6 allows 4 different types of microphone capsules to be swapped out quickly. The amount of flexibility this unit offers at its price makes it a winner. And the preamp's not too bad, either. Zoom H2n ($159). Small 4-channel handheld recorder. 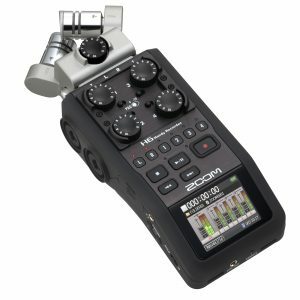 Zoom H4n Pro ($199). Two-channel recorder (plus two external inputs) with decent rubberized construction. XLR/1/4" jacks. Great price. Watch for preamp quality. 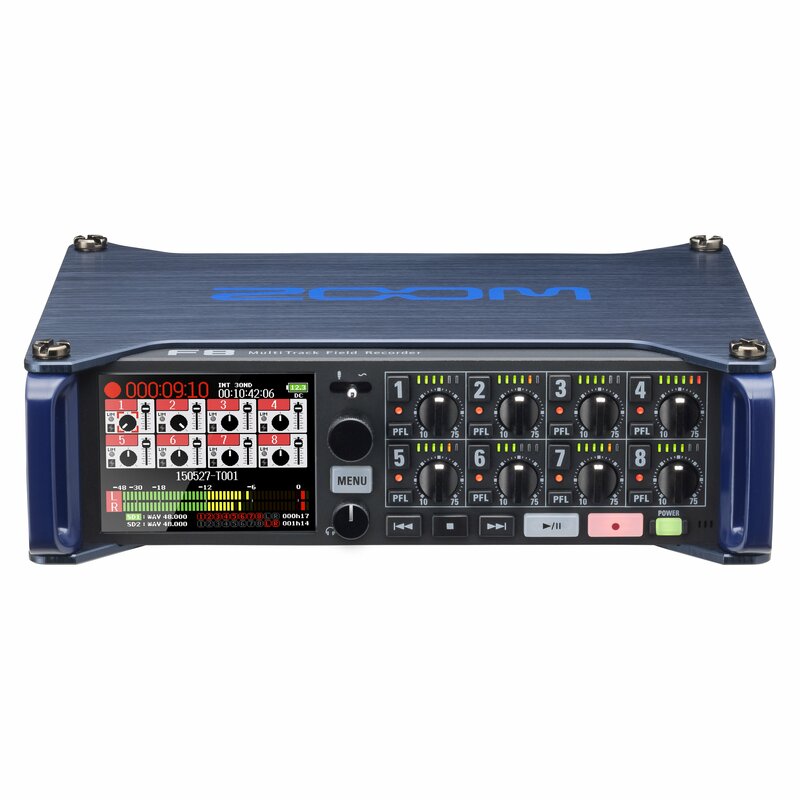 Zoom H5 (4 channels, $269). Similar to the H4n Pro, but also offers the interchangeable capsules of the more expensive H6. Tascam DR-70D ($299). 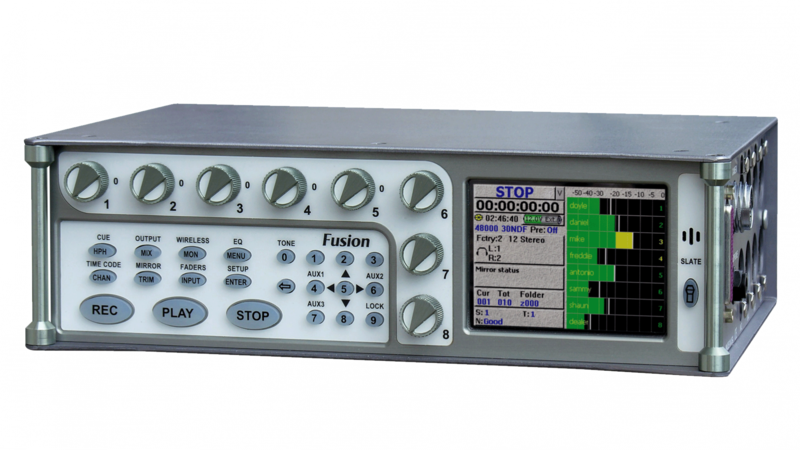 Four-channel dedicated recorder designed to work with cameras. Marantz PMD 661 MkII ($459). Two-track portable recorder with XLR/1/4" inputs popular with the field recording community. Works well with outboard microphones. Sony PCM-M10 ($199+). Once Sony’s entry-level handheld recorder. Produces good sound for its price. Sony PCM-D50 ($400). Semi-pro portable recorder with adjustable microphones and excellent sound. 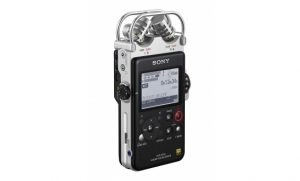 Sony PCM-D100 ($725) Two-track handheld recorder with adjustable microphones, excellent sound, clean preamp, strong metal housing. Generous onboard memory (32 GB). Lacks XLR input jacks. Zoom F8 ($899). Eight-track recorder with best features in its class. Notably includes XLR jacks and can generate timecode. Sound Devices MixPre-6 ($899). A new 6+2 channel recorder that doubles as an audio interface. Tiny form factor. Quiet, crisp, and clear preamps, and clean headphone amp. Zoom F4 ($599). 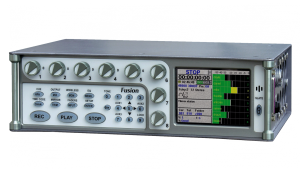 Four-channel version of the F8 dedicated recorder with fewer features and a monochrome screen. Sound Devices MixPre-3 ($649). The little brother to the new MixPre-6 with 3+2 channels that can record up to 96 kHz/24-bit. Fostex FR–2 LE ($599). Two-channel recorder. This can be found used for under $500. Tascam DR-680MKII ($505). The most inexpensive 8-channel dedicated recorder on the market (6 + 2 digital). Fostex FR–2. Dedicated recorder. Not the most robust construction but smooth preamps. Sony PCM-D50. The big brother to the more modern D100. While a bit older, its sound quality for handhelds ranks second only to the D100. Sound Devices 7xx family ($2,649 – $6,849). Featuring 2–8 channels, these recorders have bullet-proof construction, excellent preamps, and are flexible. A slight downside: you need to pack a lunch to find your way through the menus. Tascam HD-P82 ($1,999). An 8-track option that is the cheapest in this price bracket. Zaxcom family. The Maxx, (8 channels, $4,100), Nomad (10–12 channels, $6,195). Sturdy build with outstanding preamps. Heavy and bulky, and relies on touch screen for some functions. Sonosax SX-R4+ ($5,499). One of the most inexpensive sixteen-channel recorders (albeit with some non-standard input jacks). 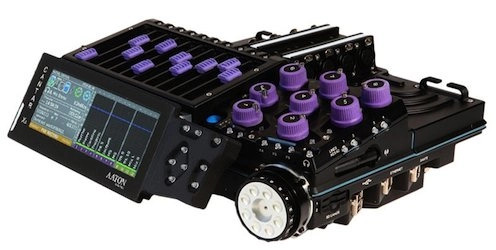 Sound Devices also offers a line of production mixers with integrated recorders ($3,328 – $5,998). These units are designed with production mixing in mind with technologies such as Dugan automixing and MixAssist to help manage multiple, diverse sources, timecode, multiple powering sources, Bluetooth remote recording control, and power redundancy. Not every field recordist will need these features, of course, but the basic recording capabilities from a Sound Devices unit and preamps are prized. Aaton Cantar X3 ($16,580). The Rolls Royce of dedicated recorders. Perhaps the priciest on the market. Known to have some of the quietest preamps available. The form factor lends itself more toward desktop or cart usage, instead of a field recording bag. Is its colour scheme hideous or a refreshing take on field recording gear? That’s up to you. 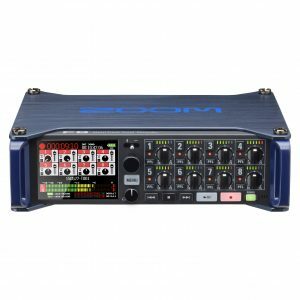 Zaxcom Deva 58 (10 tracks, $12,999). Differs from its lower-priced Zaxcom siblings with an onboard hard drive, dedicated mixing knobs, DVD-RAM drive, and luscious display. Built like a tank, but unfortunately built like a tank: heavy and cumbersome for field use. Please note that this article is not a list of endorsements or recommendations – after all, there’s no way to I could personally test every model listed here! Instead, the post is an intended as a handy list of options you can explore yourself. It’s always best to rent and test field recording gear before making an investment, if you can. Discover pro field recordist equipment choices in the “A Month of Field Recordist” series (2015, 2016). Read an analysis of those pro equipment choices (2015, 2016). Find the best field recording equipment for you in the Field Recording Gear Buyer’s Guide. Wallet a bit thin right now? 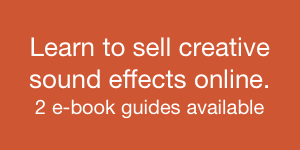 Learn How to Record Sound Effects on a Budget. Learn more about specialized microphones in The Unconventional Microphone Buyer’s Guide. Do you have a favorite recorder? Any important features I’ve missed? Share in the comments below.